Authors note: This is on my "must do" list of runs. 1000 CFS is about the minimum for this run. 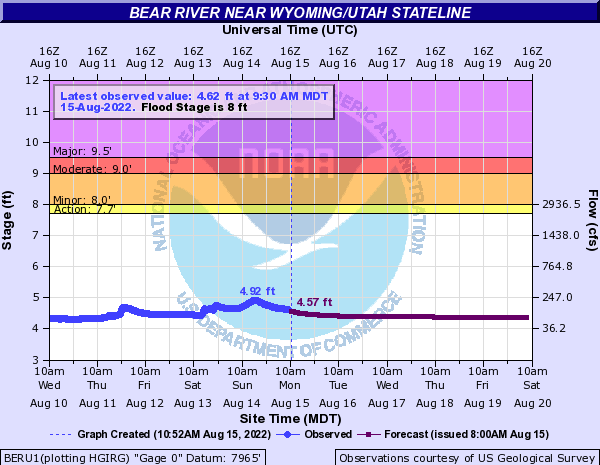 If you are in the area and the Bear River is at 1500 CFS, you need to get in your boat. If it is at 2000 CFS or above, make the drive. Unless you are immune to beautiful scenery with nonstop fun, you will be glad you showed up. This is one of the most enjoyable class 3 river sections I've ever done...and, when the water is high, it gets 5 stars of 5 possible on my scale. This is a great advanced beginner/intermediate run! It is basically one solid wave train for 3 miles with very little wood hazard. In fact, the only river wide log I've seen in many years of running this section (since 1999) was at approximately mile 2, in the one calm section on the run. There was even a big safe eddy to get off the water and walk around the log. I recommend putting in at Stillwater Camp if you've not done the run before. It only adds 3 miles of shuttle or so...and you get the entire 6.5 miles of river and an additional mile of wave train. If not, put in at Bear River/East Fork Campgrounds. You will launch right in the middle of the rapid (the 3 mile rapid) and a smile should form on your lips. There are some island/channel decisions to make along the run. I've tried them all in the past and they've always been clear of river wide wood. You will find logs/wood at the head of some islands and on some bends, so don't relax completely. You will pass under some cables, past a few cabins and under one bridge enroute (MP 2.5-ish), but otherwise the road is away from the river and it feels like wilderness. Don't take out at the private bridge without permission! There are a few boulders just above the bridge and this is probably the toughest (most technical) part of the run...though it last for only 100 yards or so. You pass the confluence of the West Fork of the Bear River during the run...but I have never been able to tell where it meets the Main Bear. You should be able to see the highway or your shuttle vehicle easily from the river at the take out. Technically, taking out at MP 51.5 is probably trespassing, but I've never had problems. Don't dilly-dally or leave a mess and hopefully it won't become a problem. There is a pull out to park at.